Background: To reduce the intensity of the work of doctors, pre-classification work needs to be issued. In this paper, a novel and related liver microscopic image classification analysis method is proposed. Objective: For quantitative analysis, segmentation is carried out to extract the quantitative information of special organisms in the image for further diagnosis, lesion localization, learning and treating anatomical abnormalities and computer-guided surgery. Methods: In the current work, entropy-based features of microscopic fibrosis mice’ liver images were analyzed using fuzzy c-cluster, k-means and watershed algorithms based on distance transformations and gradient. 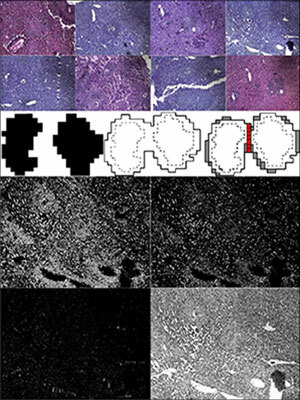 A morphological segmentation based on a local threshold was deployed to determine the fibrosis areas of images. Results: The segmented target region using the proposed method achieved high effective microscopy fibrosis images segmenting of mice liver in terms of the running time, dice ratio and precision. The image classification experiments were conducted using Gray Level Co-occurrence Matrix (GLCM). The best classification model derived from the established characteristics was GLCM which performed the highest accuracy of classification using a developed Support Vector Machine (SVM). The training model using 11 features was found to be accurate when only trained by 8 GLCMs. Conclusion: The research illustrated that the proposed method is a new feasible research approach for microscopy mice liver image segmentation and classification using intelligent image analysis techniques. It is also reported that the average computational time of the proposed approach was only 2.335 seconds, which outperformed other segmentation algorithms with 0.8125 dice ratio and 0.5253 precision. Morphological segmentation, top-hat transformation, threshold based Watershed segmentation, texture feature extraction, mice liver fibrosis, microscopic images, support vector machine.